MICHOUD ASSEMBLY FACILITY, NEW ORLEANS, LA – NASA has just finished welding together the very first fuel tank for America’s humongous Space Launch System (SLS) deep space rocket currently under development – and Universe Today had an exclusive up close look at the liquid hydrogen (LH2) test tank shortly after its birth as well as the first flight tank, during a tour of NASA’s New Orleans rocket manufacturing facility on Friday, July 22, shortly after completion of the milestone assembly operation. “We have just finished welding the first liquid hydrogen qualification tank article …. and are in the middle of production welding of the first liquid hydrogen flight hardware tank [for SLS-1] in the big Vertical Assembly Center welder!” explained Patrick Whipps, NASA SLS Stages Element Manager, in an exclusive hardware tour and interview with Universe Today on July 22, 2016 at NASA’s Michoud Assembly Facility (MAF) in New Orleans. This first fully welded SLS liquid hydrogen tank is known as a ‘qualification test article’ and it was assembled using basically the same components and processing procedures as an actual flight tank, says Whipps. And welding of the liquid hydrogen flight tank is moving along well. SLS is the most powerful booster the world has even seen and one day soon will propel NASA astronauts in the agency’s Orion crew capsule on exciting missions of exploration to deep space destinations including the Moon, Asteroids and Mars – venturing further out than humans ever have before! The LH2 ‘qualification test article’ was welded together using the world’s largest welder – known as the Vertical Assembly Center, or VAC, at Michoud. And it’s a giant! – measuring approximately 130-feet in length and 27.6 feet (8.4 m) in diameter. See my exclusive up close photos herein documenting the newly completed tank as the first media to visit the first SLS tank. I saw the big tank shortly after it was carefully lifted out of the welder and placed horizontally on a storage cradle on Michoud’s factory floor. Finishing its assembly after years of meticulous planning and hard work paves the path to enabling the maiden test launch of the SLS heavy lifter in the fall of 2018 from the Kennedy Space Center (KSC) in Florida. The qual test article is the immediate precursor to the actual first LH2 flight tank now being welded. “We will finish welding the liquid hydrogen and liquid oxygen flight tanks by September,” Whipps told Universe Today. Technicians assembled the LH2 tank by feeding the individual metallic components into NASA’s gigantic “Welding Wonder” machine – as its affectionately known – at Michoud, thus creating a rigid 13 story tall structure. The welding work was just completed this past week on the massive silver colored structure. It was removed from the VAC welder and placed horizontally on a cradle. I watched along as the team was also already hard at work fabricating SLS’s first liquid hydrogen flight article tank in the VAC, right beside the qualification tank resting on the floor. Welding of the other big fuel tank, the liquid oxygen (LOX) qualification and flight article tanks will follow quickly inside the impressive ‘Welding Wonder’ machine, Nesselroad explained. The LH2 and LOX tanks sit on top of one another inside the SLS outer skin. The SLS core stage – or first stage – is mostly comprised of the liquid hydrogen and liquid oxygen cryogenic fuel storage tanks which store the rocket propellants at super chilled temperatures. Boeing is the prime contractor for the SLS core stage. To prove that the new welding machines would work as designed, NASA opted “for a 3 stage assembly philosophy,” Whipps explained. “On the heels of that followed the qualification weld articles” for tank loads testing. What’s the next step for the LH2 tank? The test article tank will be outfitted with special sensors and simulators attached to each end to record reams of important engineering data, thereby extending it to about 185 feet in length. Thereafter it will loaded onto the Pegasus barge and shipped to NASA’s Marshall Space Flight Center in Huntsville, Alabama, for structural loads testing on one of two new test stands currently under construction for the tanks. The tests are done to prove that the tanks can withstand the extreme stresses of spaceflight and safely carry our astronauts to space. The SLS core stage builds on heritage from NASA’s Space Shuttle Program and is based on the shuttle’s External Tank (ET). All 135 ET flight units were built at Michoud during the thirty year long shuttle program by Lockheed Martin. “We saved billions of dollars and years of development effort vs. starting from a clean sheet of paper design, by taking aspects of the shuttle … and created an External Tank type generic structure – with the forward avionics on top and the complex engine section with 4 engines (vs. 3 for shuttle) on the bottom,” Whipps elaborated. 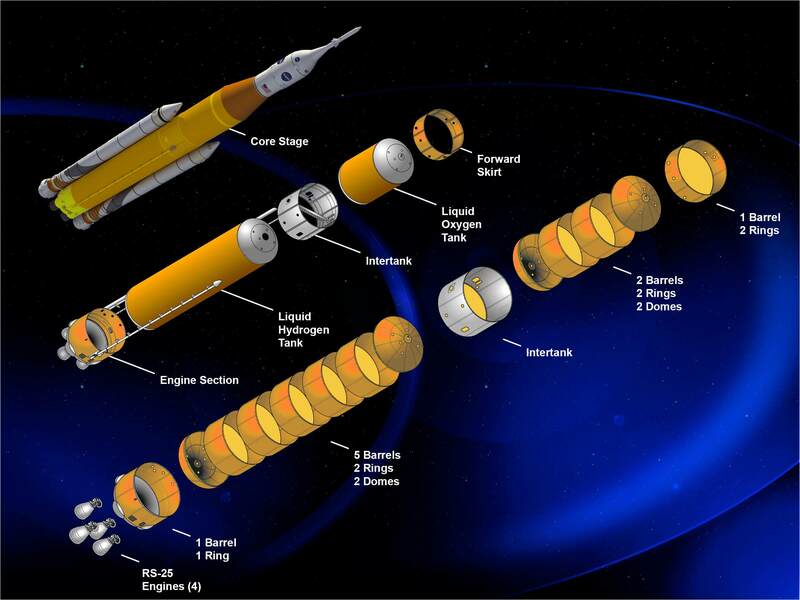 The SLS core stage is comprised of five major structures: the forward skirt, the liquid oxygen tank (LOX), the intertank, the liquid hydrogen tank (LH2) and the engine section. The LH2 and LOX tanks feed the cryogenic propellants into the first stage engine propulsion section which is powered by a quartet of RS-25 engines – modified space shuttle main engines (SSMEs) – and a pair of enhanced five segment solid rocket boosters (SRBs) also derived from the shuttles four segment boosters. The tanks are assembled by joining previously manufactured dome, ring and barrel components together in the Vertical Assembly Center by a process known as friction stir welding. The rings connect and provide stiffness between the domes and barrels. The LH2 tank is the largest major part of the SLS core stage. It holds 537,000 gallons of super chilled liquid hydrogen. It is comprised of 5 barrels, 2 domes, and 2 rings. The LOX tank holds 196,000 pounds of liquid oxygen. It is assembled from 2 barrels, 2 domes, and 2 rings and measures over 50 feet long. The material of construction of the tanks has changed compared to the ET. Overall, the SLS core stage towers over 212 feet (64.6 meters) tall and sports a diameter of 27.6 feet (8.4 m). NASA’s Vehicle Assembly Center is the world’s largest robotic weld tool. The domes and barrels are assembled from smaller panels and piece parts using other dedicated robotic welding machines at Michoud. The total weight of the whole core stage empty is 188,000 pounds and 2.3 million pounds when fully loaded with propellant. The empty ET weighed some 55,000 pounds. Considering that the entire Shuttle ET was 154-feet long, the 130-foot long LH2 tank alone isn’t much smaller and gives perspective on just how big it really is as the largest rocket fuel tank ever built. Every fuel tank welded together from now on after this series of confidence and qualification LOX and LH2 tanks will be actual flight article tanks for SLS launches. “There are no plans to weld another qualification tank after this,” Nesselroad confirmed to me. What’s ahead for the SLS-2 core stage? “We start building the second SLS flight tanks in October of this year – 2016!” Nesselroad stated. The world’s largest welder was specifically designed to manufacture the core stage of the world’s most powerful rocket – NASA’s SLS. The Vertical Assembly Center welder was officially opened for business at NASA’s Michoud Assembly Facility in New Orleans on Friday, Sept. 12, 2014. NASA Administrator Charles Bolden was personally on hand for the ribbon-cutting ceremony at the base of the huge VAC welder. The state-of-the-art welding giant stands 170 feet tall and 78 feet wide. It complements the world-class welding toolkit being used to assemble various pieces of the SLS core stage including the domes, rings and barrels that have been previously manufactured. 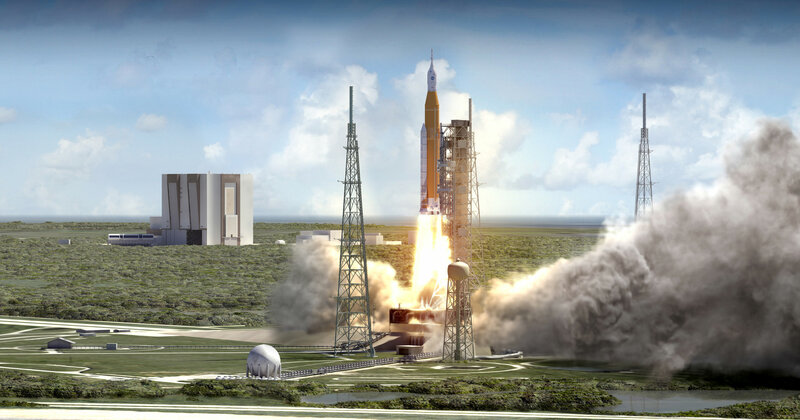 The maiden test flight of the SLS/Orion is targeted for no later than November 2018 and will be configured in its initial 70-metric-ton (77-ton) Block 1 configuration with a liftoff thrust of 8.4 million pounds – more powerful than NASA’s Saturn V moon landing rocket. Although the SLS-1 flight in 2018 will be uncrewed, NASA plans to launch astronauts on the SLS-2/EM-2 mission slated for the 2021 to 2023 timeframe. The exact launch dates fully depend on the budget NASA receives from Congress and who is elected President in the November 2016 election – and whether they maintain or modify NASA’s objectives. “If we can keep our focus and keep delivering, and deliver to the schedules, the budgets and the promise of what we’ve got, I think we’ve got a very capable vision that actually moves the nation very far forward in moving human presence into space,” said William Gerstenmaier, associate administrator for the Human Exploration and Operations Mission Directorate at NASA Headquarters in Washington, during the post QM-2 SRB test media briefing in Utah last month. MICHOUD ASSEMBLY FACILITY, NEW ORLEANS, LA – NASA Administrator Charles Bolden officially unveiled the world’s largest welder to start construction of the world’s most powerful rocket – NASA’s Space Launch System (SLS) rocket – at NASA’s Michoud Assembly Facility in New Orleans on Friday, Sept. 12, 2014. Administrator Bolden was personally on hand for the ribbon-cutting ceremony at the base of the huge welder at Michoud’s Vertical Assembly Center (VAC). The welder is now officially open for business and will be used to manufacture the core stage of the SLS, NASA’s mammoth heavy lift rocket that is intended to take humans to destinations far beyond Earth and farther into deep space than ever before possible – to Asteroids and Mars. “This rocket is a game changer in terms of deep space exploration and will launch NASA astronauts to investigate asteroids and explore the surface of Mars while opening new possibilities for science missions, as well,” said NASA Administrator Charles Bolden during the ribbon-cutting ceremony at Michoud on Sept. 12. “The Road to Mars starts at Michoud,” said Bolden, at the welding tool ceremony attended by Universe Today. The SLS is designed to launch astronaut crews aboard NASA’s next generation Orion deep space capsule concurrently under development. The state-of-the-art welding giant stands 170 feet tall and 78 feet wide. It completes a world-class welding toolkit that will be used to assemble pieces of the SLS core stage including domes, rings and barrels that have already been manufactured. It will tower over 212 feet (64.6 meters) tall and sports a diameter of 27.6 feet (8.4 m). The core stage stores cryogenic liquid hydrogen and liquid oxygen. Boeing is the prime contractor for the SLS core stage. The SLS core stage builds on heritage from NASA’s Space Shuttle Program. The first stage propulsion is powered by four RS-25 space shuttle main engines and a pair of enhanced five segment solid rocket boosters (SRBs) also derived from the shuttles four segment boosters. 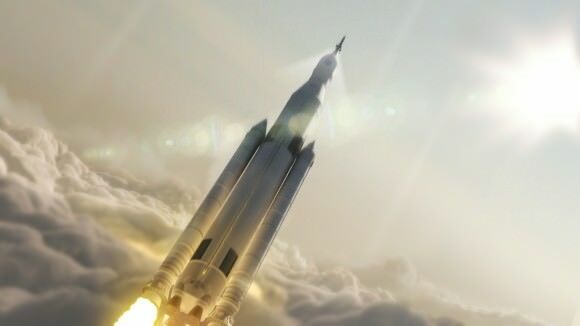 As I reported recently, NASA managers formally approved the development of the agency’s mammoth Mars rocket after a thorough review of cost and engineering issues. “The SLS Program continues to make significant progress,” said Todd May, SLS program manager. The maiden test launch of the SLS is targeted for November 2018 and will be configured in its initial 70-metric-ton (77-ton) version, top NASA officials announced at a briefing for reporters on Aug. 27. The decision to move forward with the SLS comes after a wide ranging review of the technical risks, costs, schedules and timing known as Key Decision Point C (KDP-C), said Associate Administrator Robert Lightfoot, at the briefing. Lightfoot oversaw the review process.